We have had pretty much the same weather all week. Hot and humid with sunshine until the afternoon when we have had thunderstorms. This morning Gloria and Larry were responsible for our devotion. We again enjoyed good music before we started. We will miss Bryant and Gene’s music next week. Larry and Gloria challenged us to quit worrying and trust God, because He loves us. Thanks, Larry and Gloria! After devotion we headed back to James’ house. 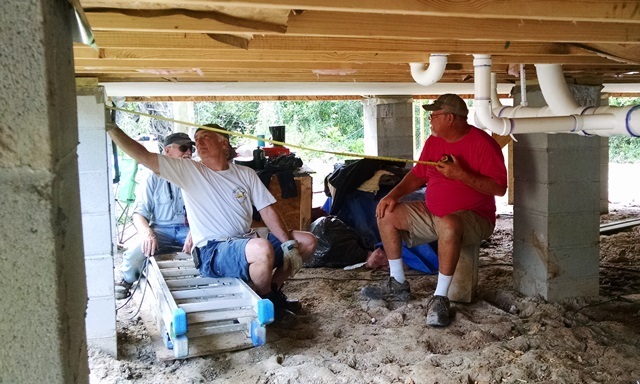 Max, Anne, Gene, Bryant and Gloria continued the work underneath the house, installing ¼ inch plywood to seal in the floor insulation. One of the few times Anne found it to be advantageous to be short. It is hot and dirty work but we made some progress. We are almost halfway done. 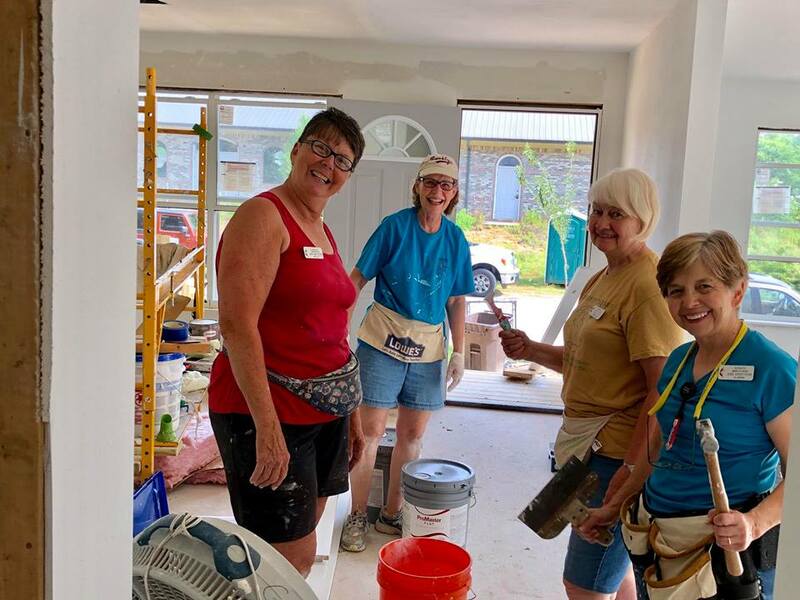 Upstairs, Mary Ann, Jackie, and Larry worked on touching up the paint and generally cleaning up and loading up tools. We only worked until about 11:00. We then headed back to the rigs to get cleaned up in order to attend the 2018 Appreciation Banquet Celebrating Volunteers and Partners sponsored by R3SM. 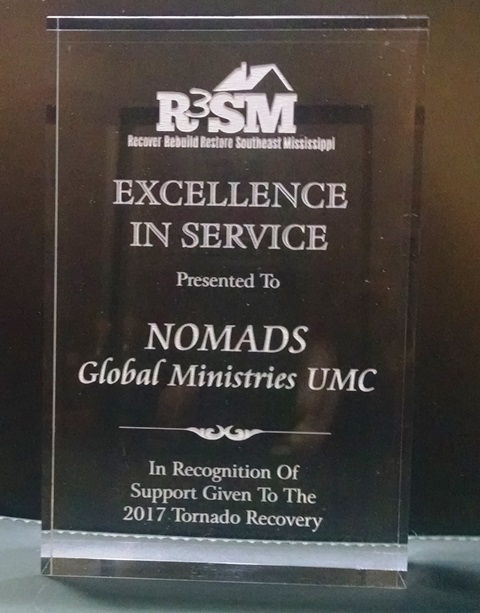 It was a very nice event and NOMADS were recognized for our service to the community and received a very nice plaque, along with the Mennonite Disaster Service (MDS) who completed their work yesterday and are headed back to PA tonight. 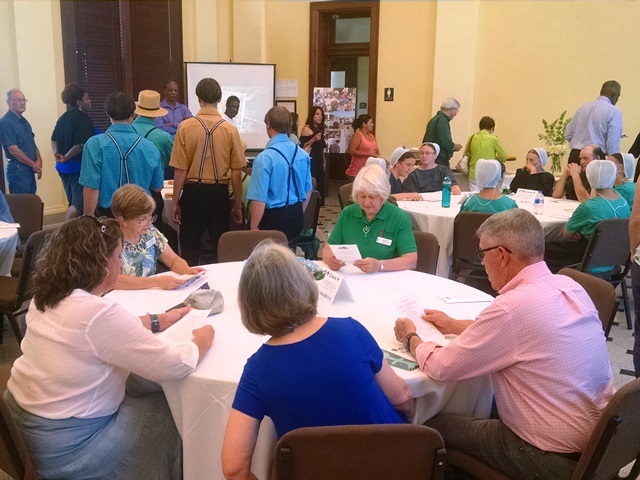 For those that don’t know, we are known as the M & Ms – Methodists and Mennonites. 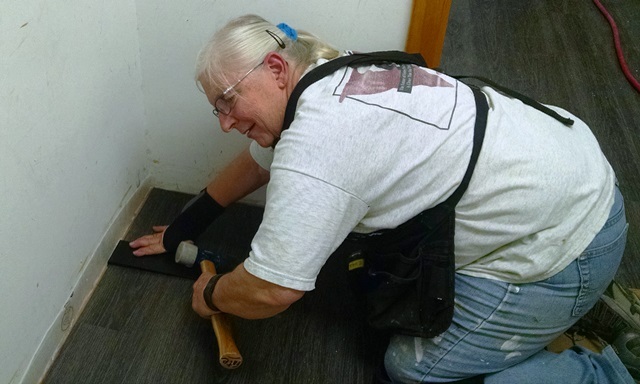 The M&Ms are known as the last to leave a disaster area because we work to meet unmet needs. A lot of the businesses and churches that have worked to raise funds for the recovery as well as other volunteers were also recognized. 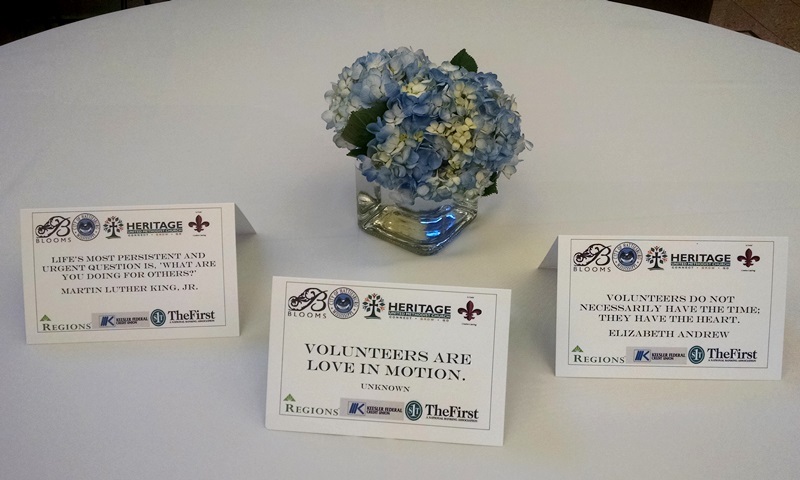 We learned that there have been over 35,000 volunteer hours worked in the Hattiesburg area the past year, valued at over 1 million dollars. Thank you, R3SM for all you do in the Hattiesburg area. 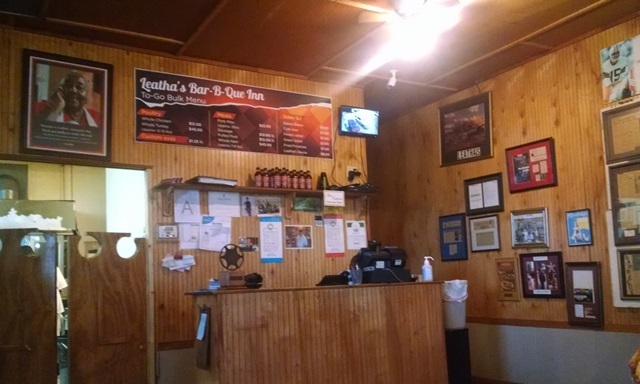 Tonight the team went to Leatha’s BBQ for our last dinner together. 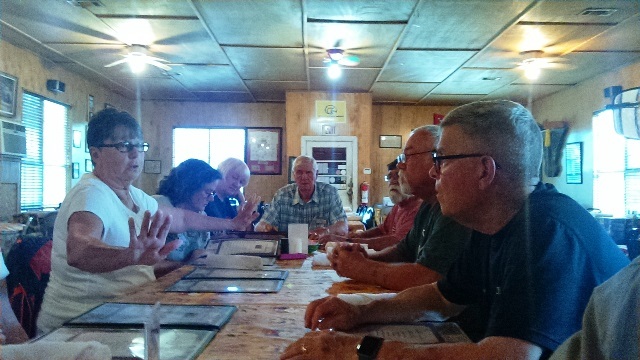 Great food and service at a small local BBQ, but the fellowship was even better. This has been another good team and we will miss them. Everyone but Max and Anne and Nula are leaving in the morning and headed home. We wish them all safe travels until we meet again sometime down the road. After a wonderful meal we returned to Oak Grove UMC and Nula served us all banana pudding. Thanks so much, Nula. The pudding was wonderful and gave us a little more time with the team. We now have to do some work to get ready for the new team members who start arriving tomorrow. Looking forward to two more weeks of service and hopefully getting James’ in his home. It was another hot day, with high humidity. But at least the rain held off until after supper. We provided the devotion today with “The Parable of the Pencil” – one of our favorites. And really enjoyed the singing today with Gene and Bryant on guitar. At work we both worked under the house all day. 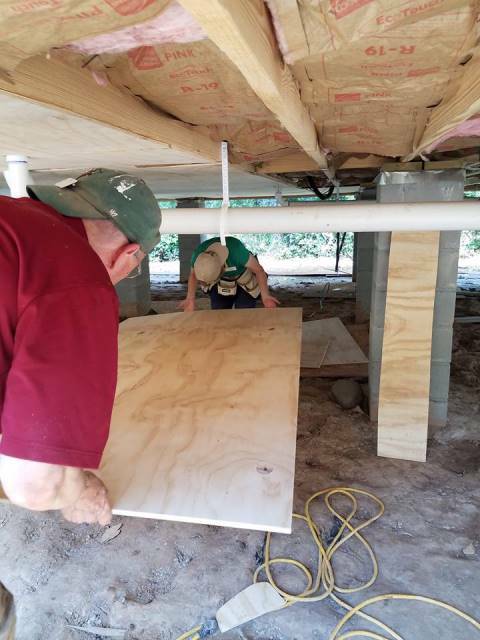 We spent the day with some other team members and Paul, a local volunteer, in the 56” high space installing ¼” plywood to cover the under floor insulation. Anne even had to bend over a little. 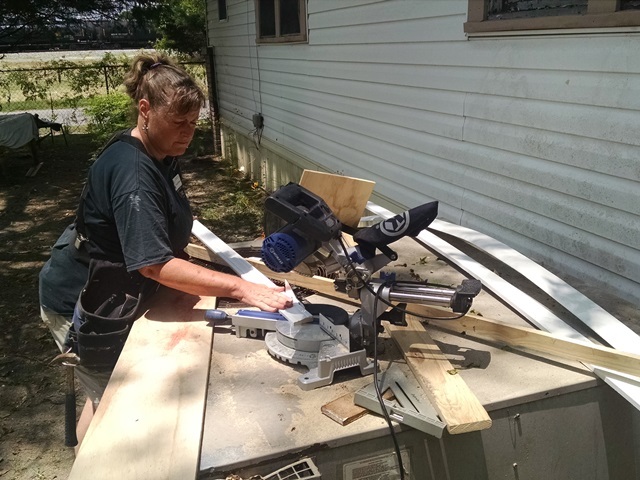 We all used our heads and backs holding up the plywood while we stapled it in place, in ways God never intended us to use them. We will probably feel it in the morning . We completed about 40% of the installation. 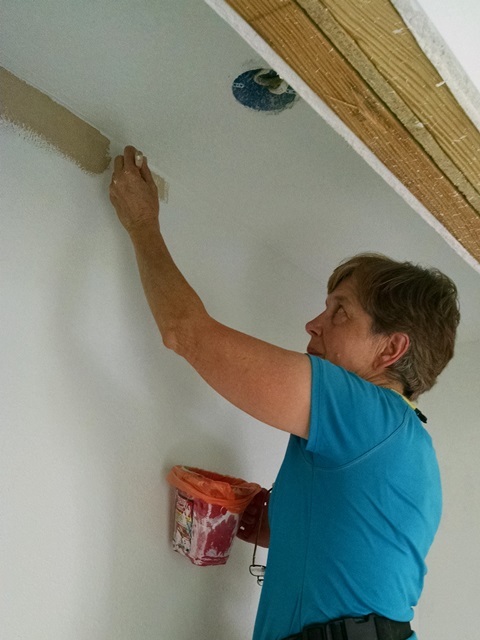 The Mennonite Disaster Services obtained a grant to make the house they build more energy efficient so this was part of that project. 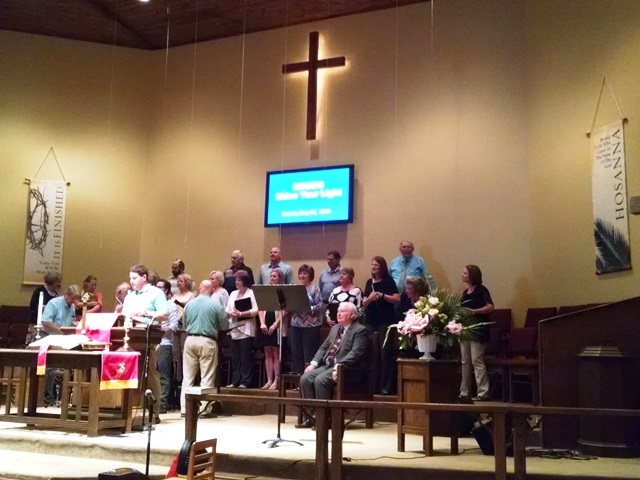 After work we attended a dinner in honor of the graduates at Oak Grove UMC. Delicious prime rib with all the fixin’s. About the time we arrived back at the rig the bottom fell out and it rained for about an hour and a half. Today was another really hot day. When we left for work today the TV station reported 100% humidity. Don’t know if that was exactly accurate but it sure felt it. It was hot all day until we were driving home. It had already rained at Oak Grove UMC before we returned and about 6:30 we had a thunderstorm with lots of lightening and it is still raining at 8:30. The locals will be very happy. Bryant and Jackie had our devotion today. 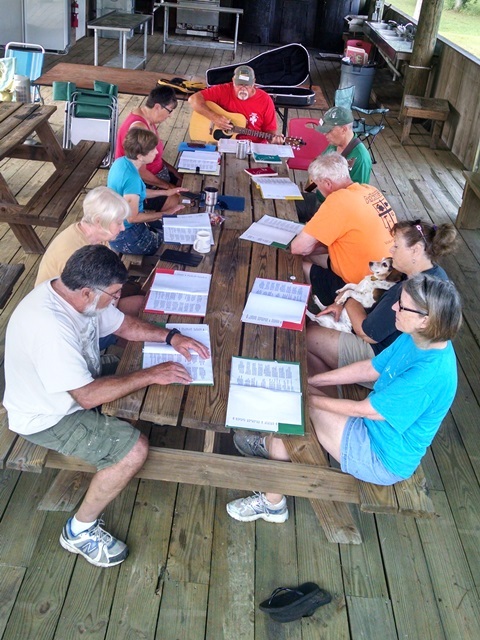 Again some of us gathered early for a time of singing with Gary and Bryant on the guitars. So nice to have good music. The devotion for today was from Hebrews 13:1-6 from The Message, with yesterday’s reading from the Upper Room. Good devotion with good music. We were then all off to the job sites with us all returning to the same jobs as yesterday. Traffic didn’t seem quite a bad as yesterday. Back at James’ we returned to painting. Today the bedroom, laundry room and bath room were completed. 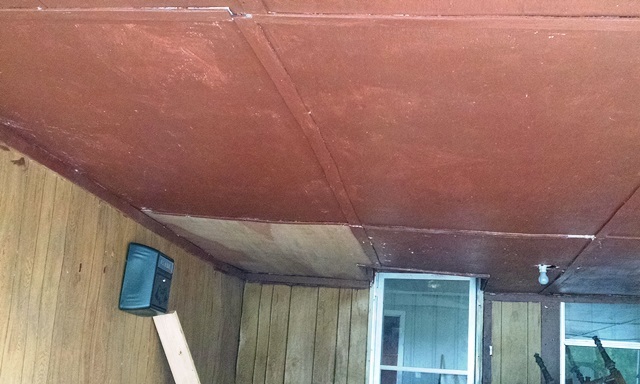 The final coat of paint was put on the kitchen and living room ceiling. 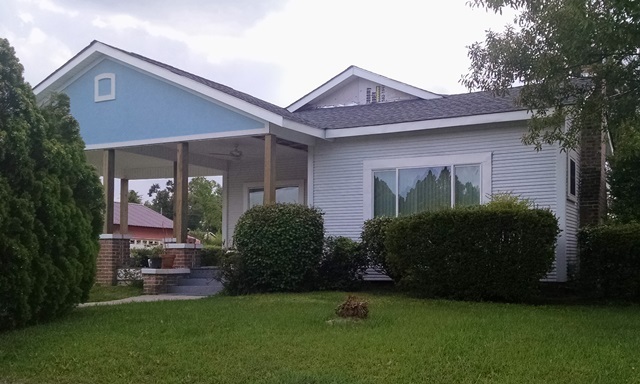 All the window and door trim was painted. 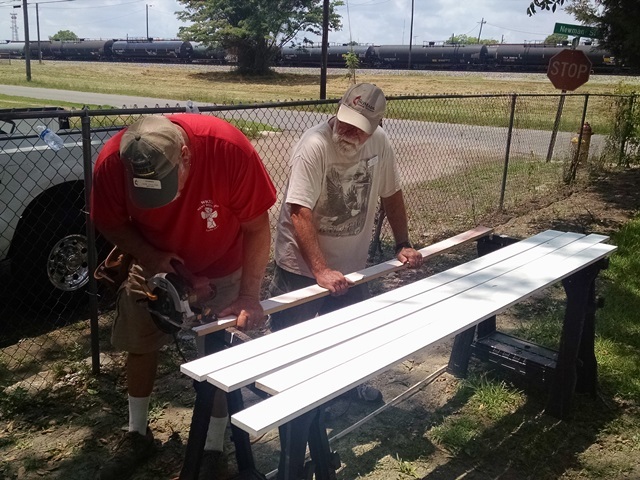 Later in the day Bryant and Norman worked on installing the window trim. Hopefully they will be able to finish that tomorrow. 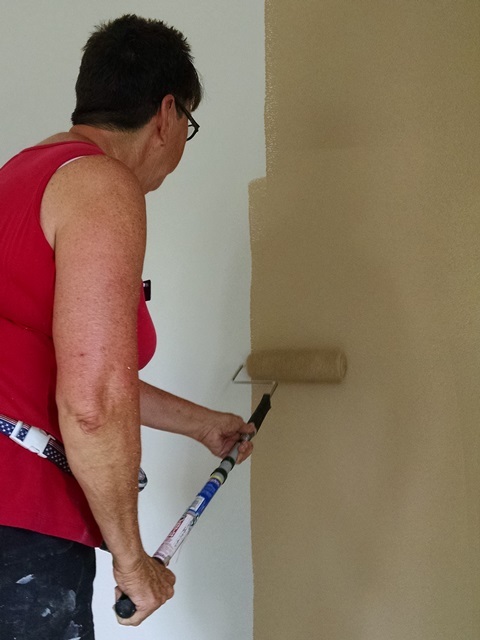 The rest of us painted the second bedroom, laundry room, bathroom, started the kitchen. The ceiling in the kitchen and living room was completed. And the furnace room was also painted. We didn’t get the painting completed today but hopefully tomorrow. 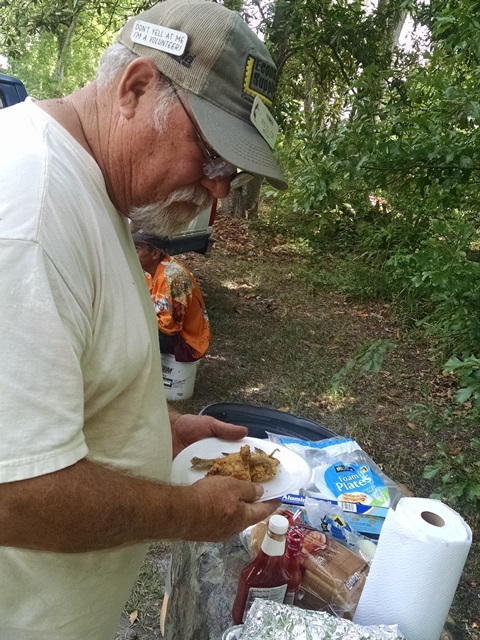 This afternoon, James and his son, James, Jr., cooked the team fried fish. James Jr. went fishing yesterday and caught bream, bass and trout. They fried it up for us as a way of saying thanks. We also got to meet James daughter and two of his many grandchildren. It was a special time with the family and certainly we appreciated it. The folks working at Mary’s house completed all their work there for now. 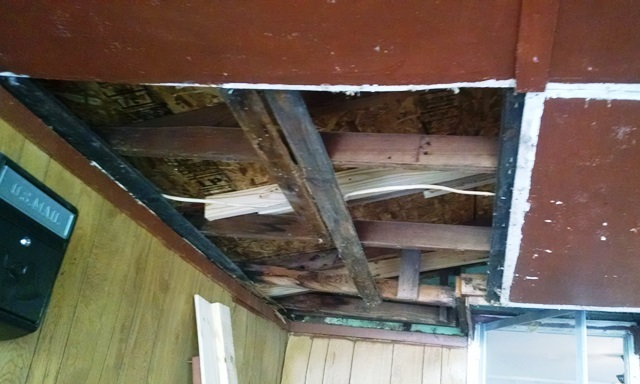 They worked on some electrical issues, and reinstalled the ceiling in the carport. We think the funding hasn’t come through for the flooring but for now we have been pulled from there and tomorrow we will all be at James’s house. It was another good day. Tonight, four of the ladies had a ladies night out, NOMADS style. We left the guys at home and went to Lowe’s. We looked at tools, paint supplies, ladders and anything else that struck our fancy. Then after buying a few things we needed for tomorrow, we returned to Oak Grove. Yep, that was our ladies night out. Some would think that wasn’t very exciting or interesting but we had fun visiting with each other. It was another beautiful morning in Hattiesburg. The high was suppose to be 83 but it was higher. It is still 82 now at 8:00pm. It was a hot and humid work day. Again had to work to stay hydrated. We of course started the day with devotion. It is such a treat to be working with Gene and Bryant because they both play the guitar for us. Good music before devotion time and good singing with the guitars at devotion. Mary Ann had us read parts of The Carpenter’s Tools where we were each a different tool. It was good and fun. Anne was sandpaper and Max was ruler. We then headed to the job sites. Anne worked at James’s house and Max worked at Mary’s. Both were about 30 minutes from Oak Grove UMC and only about 5 minutes apart. We met at the R3SM office for lunch but took our breaks separately. 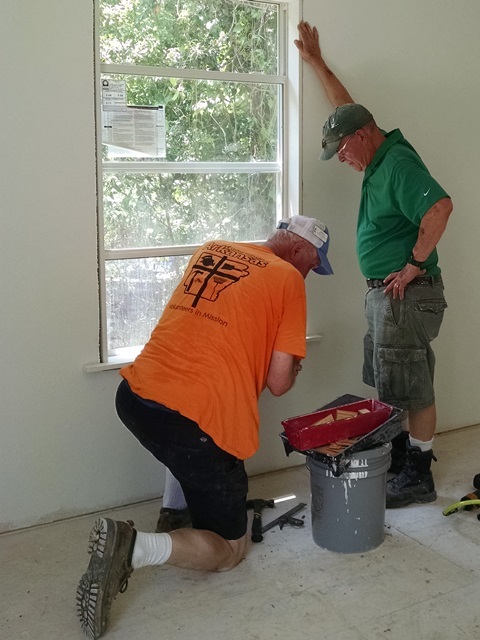 John’s house is a new build that was built by the Mennonite team. 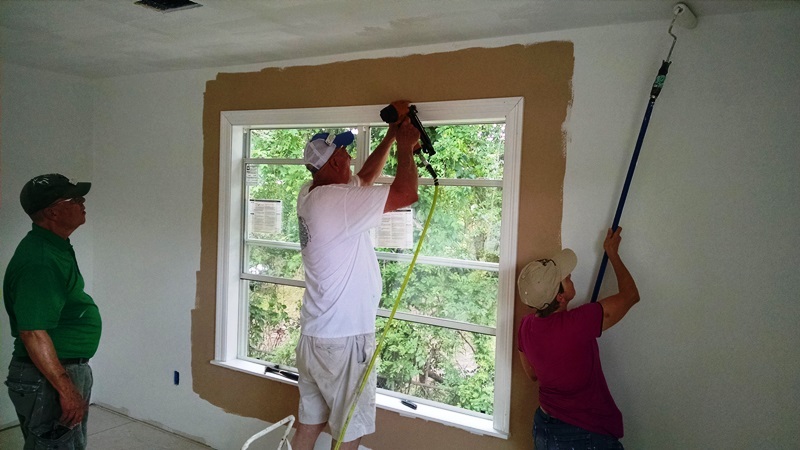 We are doing the inside work and are currently painting, and installing window trim. Today we completed priming all rooms. 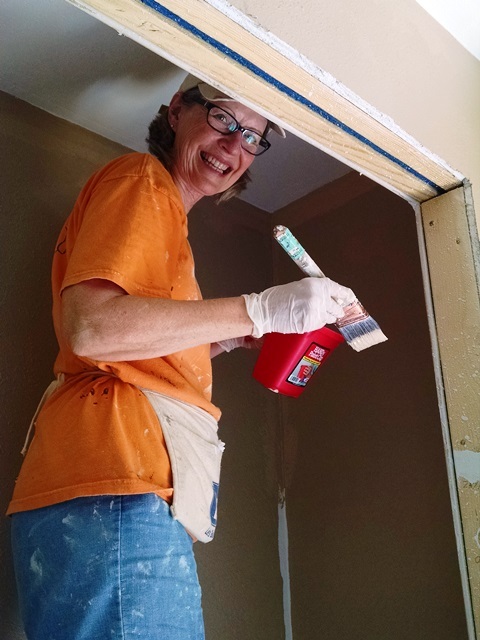 We have final ceiling and wall paint in one bedroom. All the ceilings have final paint except kitchen and living room. One of the hall closets was also completed. 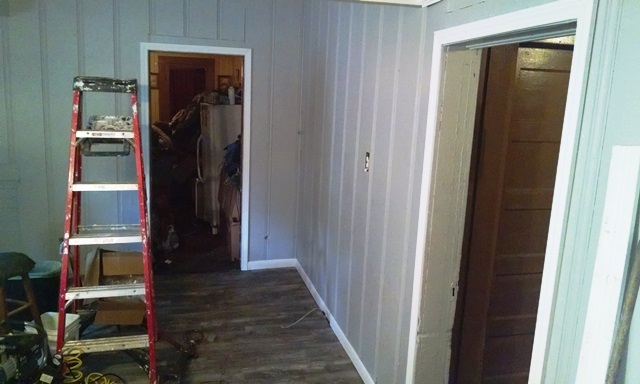 We should finish most of the painting tomorrow. 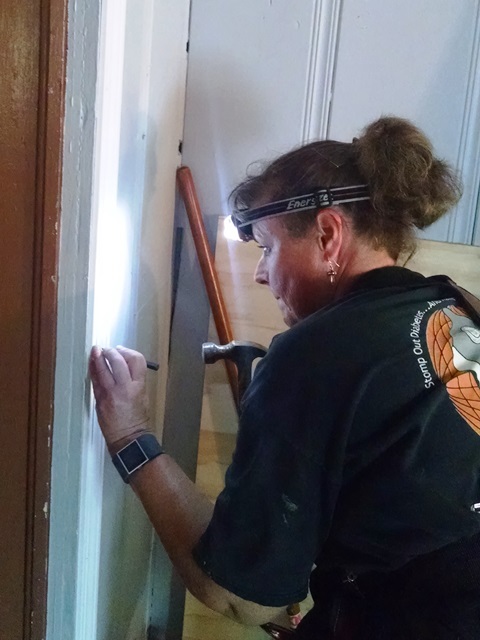 At Mary’s we repaired an exterior door frame, framed a window, painted trim, removed a section of of the porch ceiling and installed trim around two interior doors and some base board. 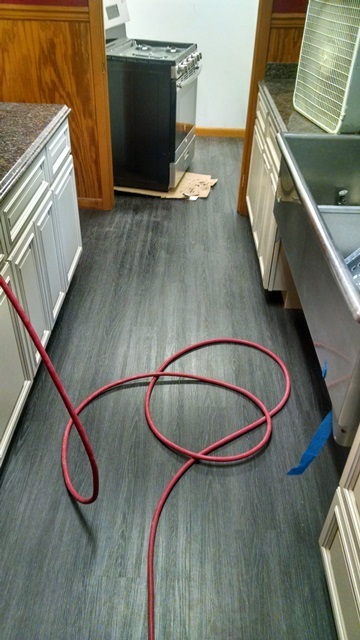 If the flooring is there in the morning, we will be installing that tomorrow. It was a busy day at both houses. James came by his house late this afternoon. 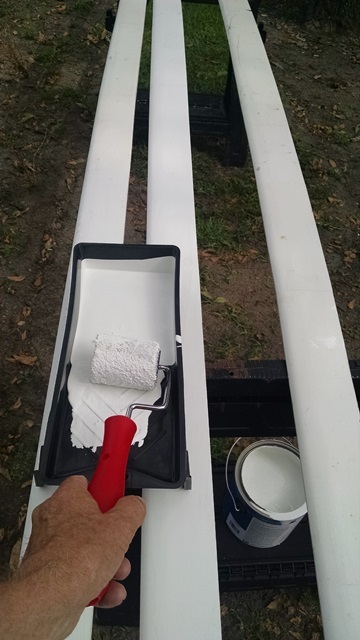 He likes the paint we are using and we learned a little of his story. He was at his house when the tornado struck. His house was deemed not repairable and was bulldozed. He is very excited seeing the progress on his house. We don’t really know Mary’s story yet. More tomorrow. Our first day back in Hattiesburg, MS began bright and sunny. Don’t know what the high was or even what was predicted but it was cooler than Baton Rouge. Between 5:00 and 6:00 tonight we had a thunderstorm come through with lots of rain in a short period of time. The temperature dropped rapidly and it’s rather pleasant out tonight. From the sounds of the thunder we might get some additional rain which is needed badly here. The team attended church together at Oak Grove UMC this morning where today was the Baccalaureate service. Pastor Andy talked to the graduate but his message was very applicable to all attending. The congregation at Oak Grove are very welcoming and supportive of NOMADS. 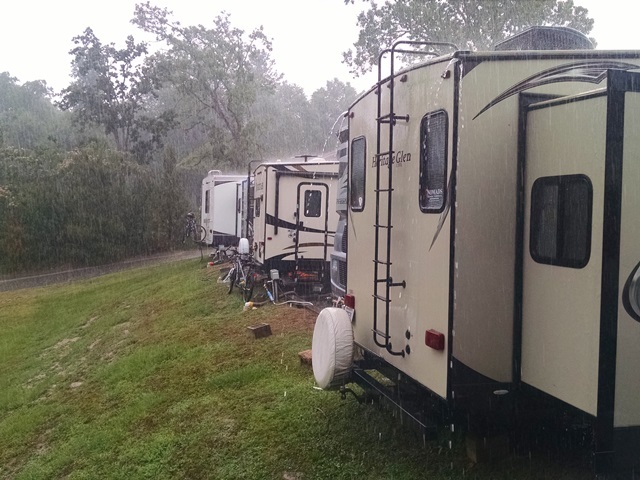 They allow all our rigs to park in their parking lot, providing us full hookups at no charge. They also include us in their Wednesday night dinners and anything else going on at the church while we are here. After church the team went to Cracker Barrel for brunch. We had a nice meal and good time visiting with everyone. This afternoon we had to pick up a few groceries for the week and then some of the team played a game of Jokers and Pegs. That’s a new game to us so today was observation. Anne’s phone died today so that has caused some problems. We currently have a spare phone and we have transferred the sim card in hopes that everything will be back to normal soon. Yep, we are going to have to replace our old Droid Minis soon. But we like our phones. Oh well, we may go shopping one afternoon. In the mean time, if you can’t get us on Anne’s phone, try Max. Looking forward to beginning our work here tomorrow. It was another sunny morning in Baton Rouge. It was a little foggy early this morning. They were headed back for hot temperatures, but we weren’t there to experience it. We got up and continued the interior pack up that we started last night. We went in the church and made sure we left everything there as it should be, then finished up the outside pack up. A little breakfast and hugs from Carol, Dave, Stel and Jodi and it was time to put Baton Rouge in the rear view mirror. We departed at 9:55. Anne drove the first leg today, to the Mississippi welcome center, with light traffic and no accidents or construction delays. Max drove the remainder for the way to Hattiesburg, MS, again with light traffic. 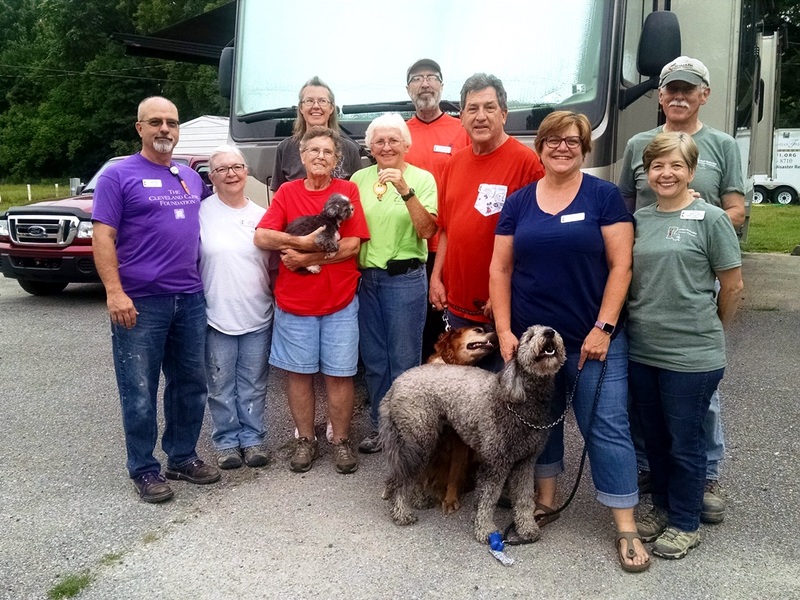 When we pulled into Oak Grove UMC about 1:00, we were greeted by our leaders Mary Ann and Gene, as well as Jackie and Bryant, and Gloria and Larry. We have worked with Gene and Mary Ann previously and look forward to our week with them. We also worked with Jackie and Bryant about a year ago and it was great to see them again. Great to renew precious friendships. 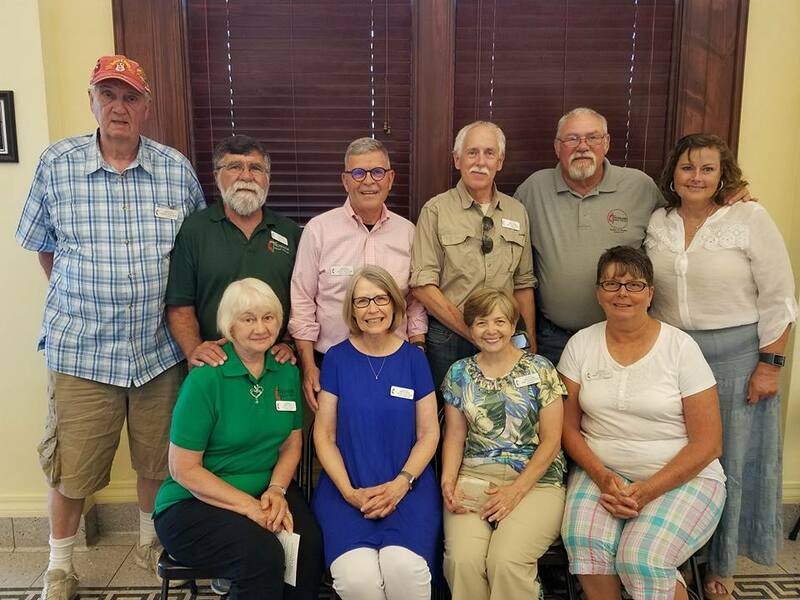 We had met Gloria and Larry at Amana annual meeting last year but haven’t worked with them or our other team members Norman and Nula. So now we have four new friends. After getting Fred parked and setup, Gene and Mary Ann came over for a tour of the new rig and a visit. It was nice to have a little time to get caught up. The team had supper all planned. 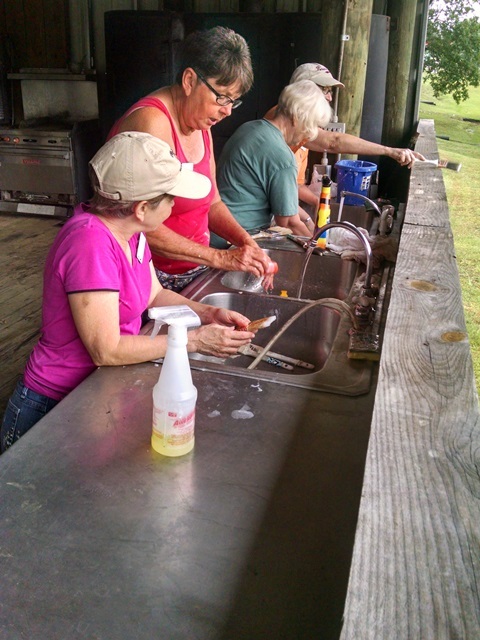 Gloria made a chicken white bean chili, Mary Ann made fried corn bread and Jackie brought the salad. It was all so good. And then we had ice cream for dessert. Thanks so much, team. It’s always nice to not have to worry about what is for dinner on a travel day. After dinner we cleaned the love bugs off the front of Fred and then joined the team for some games. We played Catch Phrase – guys against gals. It was a fun evening. We left the rest of the team playing to return to Fred to finish the laundry, write the blog and rest. Don’t forget to be praying for your pastors and the services tomorrow. Stay safe everyone. Today was another beautiful HOT day. However, just before leaving work a little before 4:00 it started raining. Amazingly, when we were driving home this afternoon it was 72 degrees. All week long it has been above 90, 93 the past two days, when we drove home. 72 – Nice! We started the day this morning with Pastor David coming over to take a picture of the team before everyone started leaving. He frames a picture of each team that stays at Francis Asbury UMC and hangs it in the hallway of the church. After visiting with Pastor for a while, Stel, Dave, Carol, Anne and Max headed back to Richard’s house to try to finish up some of the loose ends we left yesterday afternoon. The project is officially over but we decided to stay one additional day. We all have other places we have to be next week so today was the last day. We missed Lisa and Mark today but they had to head home this morning. They will be enjoying some grandparent duties tomorrow. We feel really good about what was accomplished today. 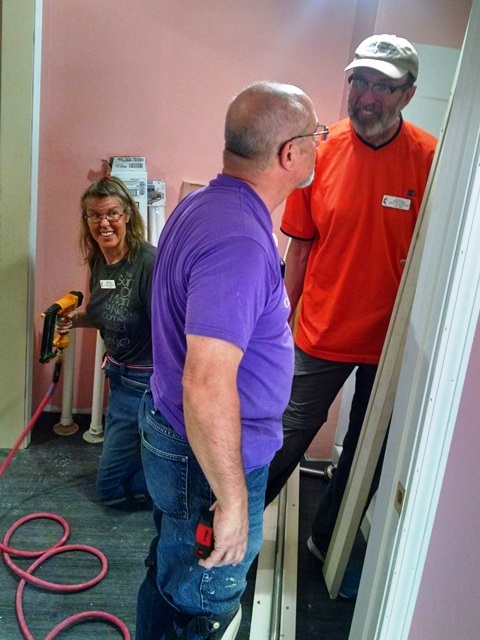 When we left today all the doors were hung, all the flooring was completed, the shower was caulked, most of the base was down, trim work was up, transition strips were installed and a lot of clean up was done. Doors installed in second bedroom. 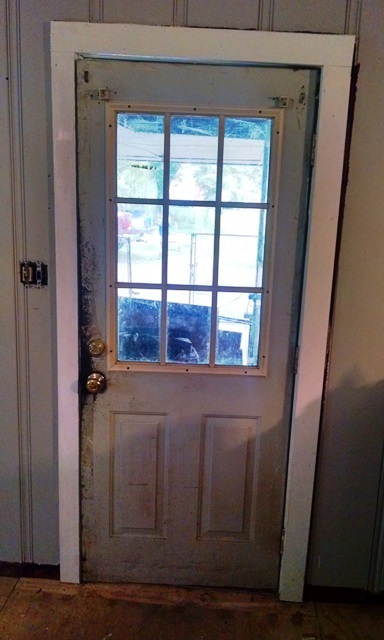 One door is not trimmed because part of the wall had to be left unfinished to allow the shower to be plumbed. 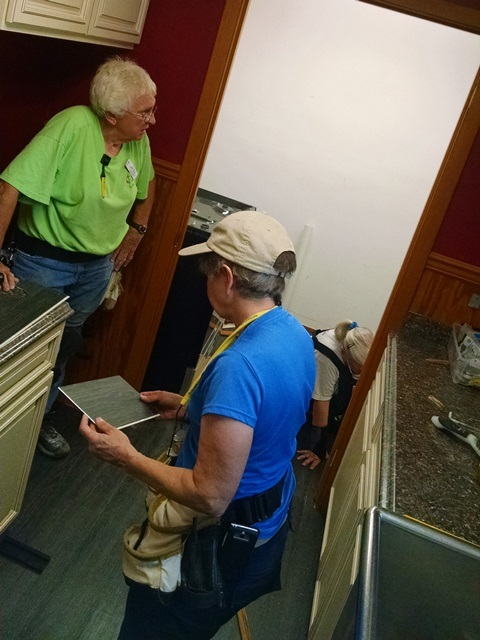 We brought a lot of the tools and other supplies back to Francis Asbury for storage and use by the summer volunteers. 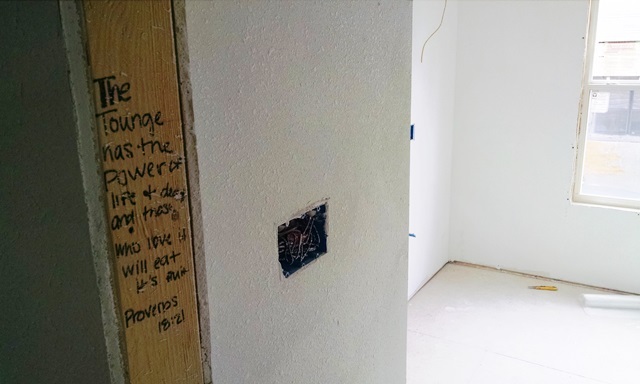 There is a youth group already scheduled to go to Richard’s to do all the construction debris cleanup, get the large heavy tools back to the church and install the insulation under the house once the plumbing is complete. 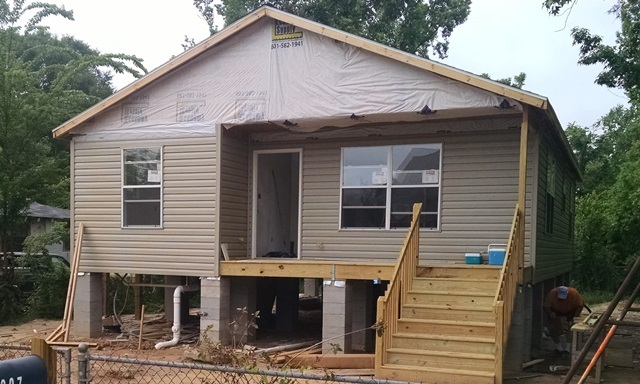 The plumbing should be complete next week and Richard and Sandy should be able to move into their new home. They are very excited and happy. We can only try to imagine our home being bulldozed down after a flood and still living in a FEMA trailer 22 months later. May God continue to be with Richard and Sandy as they finally get to move in their home. We have promised them we will visit them next February when we return to Baton Rouge. Looking forward to that reunion and seeing them enjoying their home. Thank you to all the Louisiana UM Disaster Response team members, Francis Asbury church members and the entire Baton Rouge community for so warmly welcoming us and allowing us to assist in your rebuilding efforts.